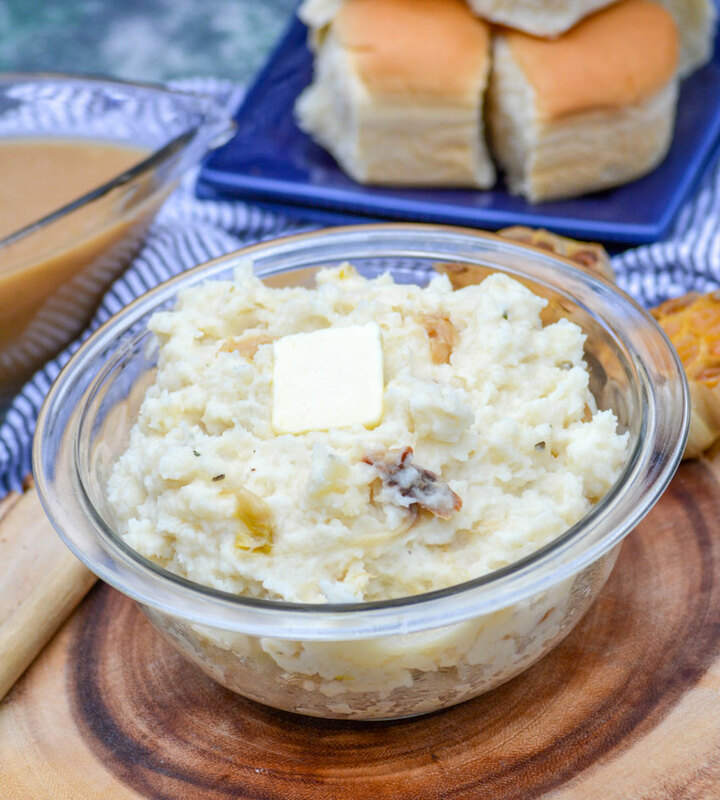 Mashed potatoes were a staple in our home growing up. I vividly remember sitting at my Grandma’s feet, helping peel potatoes while her soaps played in teh back ground. I wasn’t supposed to watch them, my Mom obviously didn’t approve. Neither did Grandma really, but I think she thought I’d be so engrossed in the vegetables that I wouldn’t pay any mind to what was on the TV. Ha! I adored those shows as much as she did, probably because she did. Even when I didn’t understand half of what was going on. After carefully peeling them, hers obviously better than mine, she’d chop them and boil them to tender perfection. When that was done she’d add some butter, cream, salt & pepper, and hand mash them into a creamy delicacy. I still can’t hand mash potatoes to a uniform creamy consistency. She always managed though, and made it seem so easy that it was like magic. Well, nobody could quite manage it like she did- but my sister took over the potato game after Grandma passed. Boy, she makes some mean ones too. So creamy they want to fall off the spoon, and simply melt in your mouth. Her secret? On top of using whipping cream (the real, fatty stuff) just like Grandma, she whips them in her Kitchen Aid mixer. It makes them super soft, extra fluffy, and darn near fool proof. I think Grandma would be proud of her ingenuity, even without the extra elbow grease. 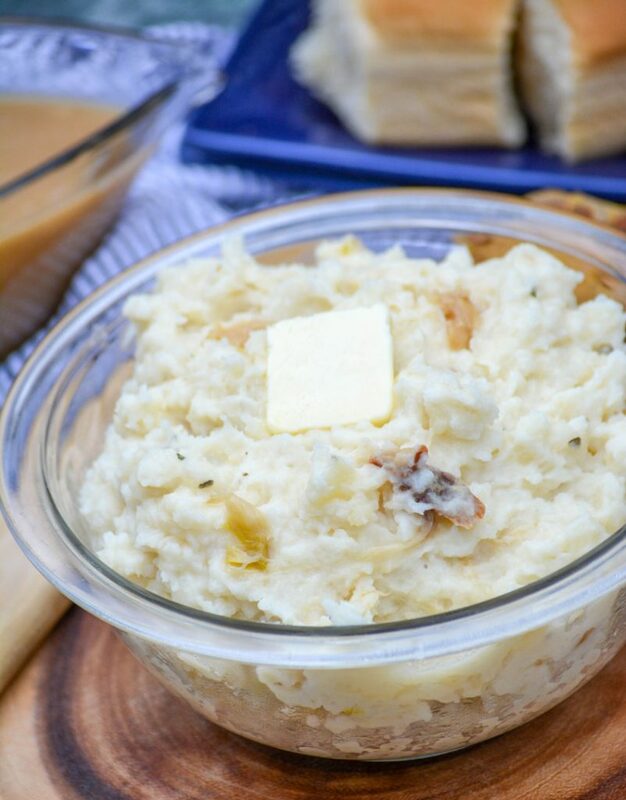 So for these Creamy Roasted Garlic Mashed Potatoes, I took a note from both of their infamous recipes. I kept my sister’s addition of real cream. Then I went back to my Grandma’s method of hand mashing them. A little extra work for sure, but well worth the effort. It was only natural that I added my own special touch this go round. It may or may not have been influenced (heavily) by the Hubs introducing me to the golden beauty that is roasted garlic. I knew about roasted garlic, but what I was familiar with was a poor imitation & paled in comparison to homemade roasted garlic. I didn’t realize how easy it was to make either. Luckily, marrying an Italian changed all that for me, for the better! Oh, and cheese- because both my husband & I adhere to the philosophy that just about everything and anything is made better by adding cheese. I suggest getting the garlic going before starting on the potatoes. The potatoes will be tender a bit before the garlic will be, and there’s a rest period for the roasted garlic. It needs to cool significantly before using in the recipe. While you could drain the potatoes and set them aside to wait, cooled potatoes will take a lot more time and effort to get creamed by hand- and have a nasty habit of taking on a waxy consistency. Take a nice, bulbous garlic bulb and cut off the top- just enough to expose all the cloves inside. Place it on a large square of foil, with the exposed bulbs facing up. Drizzle a tablesppon of olive oil over top, making sure to get as much as you can on the exposed cloves. Bring the edges of the foil up, and twist to tightly seal the sachet. Bake the garlic at 350 degrees for 35-40 minutes. Remove the roasted bulb, and allow it to cool until safe to handle. Squeeze any remaining oil into a small mixing bowl, and also squeeze out the roasted garlic cloves into it too. Mash the garlic & oil together until it’s a paste. Set aside. Now get started on the potatoes by adding them to a pot, and covering them with water. Boil the potatoes until they’re tender. Drain the cooked potatoes, and transfer them to a large mixing bowl. Use a potato masher to roughly mash them, just to break up the big chunks. Add in the garlic paste, olive oil, butter, milk, cream, cheeses, salt, and pepper and continue mashing until the potatoes are smooth and creamy. The Creamy Roasted Garlic Mashed Potatoes can be served at this point, as is. If you’re like me though, you don’t just want your taters warm but you prefer them piping hot. If that’s the case, transfer them to a buttered casserole dish. Bake the dish at 350 degrees for 15 minutes, or until the potatoes are heated through out. Dot with dabs of butter, let them melt, and then scoop and serve. The best meals are always rounded out by the best side dishes. 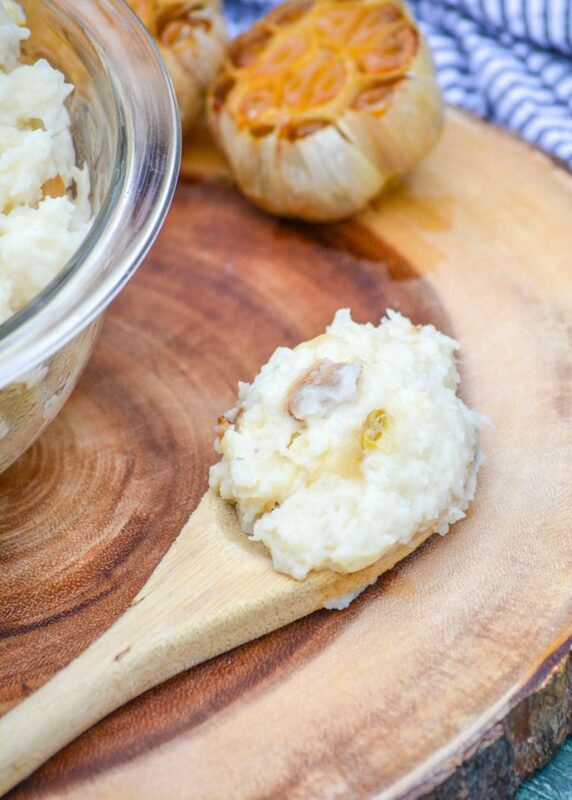 These creamy roasted garlic mashed potatoes are great whatever the occasion, a regular family supper or as an indulgent side to a special holiday gathering. 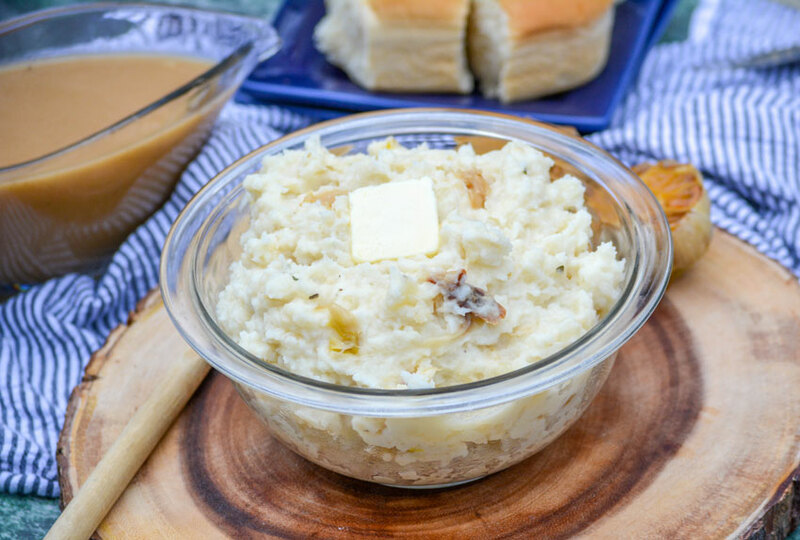 Creamy homemade mashed potatoes are infused with fresh roasted garlic, cream, and a blend of rich cheeses. Cut the top off of the garlic bulb, just exposing all the cloves. Sit the garlic bulb on a square of foil with enough excess to wrap it tightly and completely, and pour the olive oil over top. Bringing all the corners of the foil up, twist them together to tightly seal the bulb. Bake the garlic bulb at 350 degrees for 35-40 minutes. Remove it from the oven, let it rest for 2-3 minutes, then unwrap. Allow the garlic to cool almost completely. Squeeze the cloves out into a bowl, adding any oil left in the tin foil, and mash until a paste has formed. While the garlic is cooling, add the potatoes to a pot, and add water until the potatoes are covered by a 1/2". Bring the pot to a boil, and reduce the heat to a simmer- cooking until the potatoes are fork tender. Drain the potatoes and transfer them to a large mixing bowl. Using a potato masher, roughly mash the potatoes. Add the garlic paste, olive oil, butter, milk, cream, cheeses, salt, and pepper and continue mashing until the potatoes are smooth & creamy. 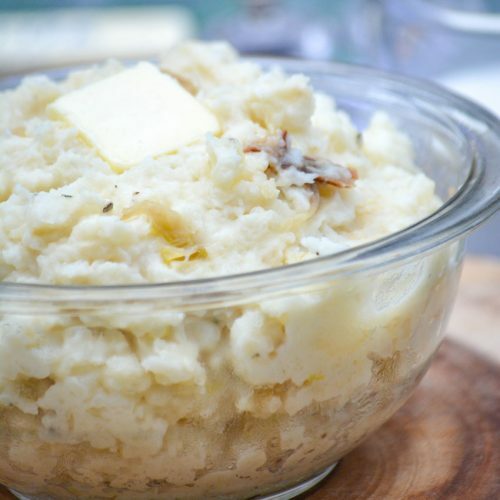 You can serve as is, or if you want the potatoes piping hot- transfer the mashed potatoes to a small buttered casserole dish. Bake them at 350 degrees for 15-20 minutes, or until hot throughout. Dollop them with pats of butter, and let them melt before scooping and serving. 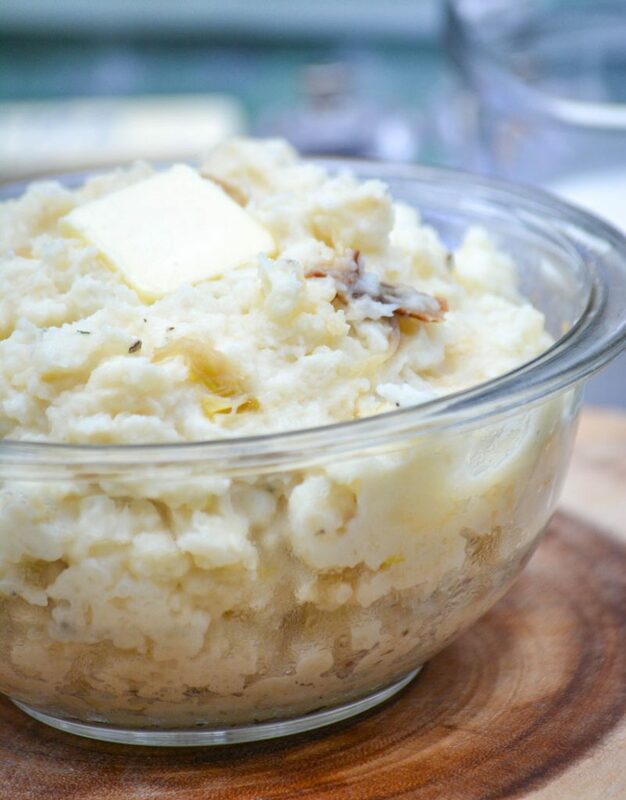 Thanks so much for bringing over this perfect mashed potato recipe to Fiesta Friday this week!